Spring has arrived and I’m coming out of hibernation. You’d think that I would have had plenty of time to blog throughout the winter but it just didn’t happen. I guess I’ve been busier than I thought keeping my parents healthy and entertained through the dreary winter months. When it comes down to it, that of course, is most important and a more precious use of my time. After 3 years of residing back here in Wisconsin, and learning to embrace winter, I’m happy to see winter losing its grip. Spring is here at last, at least according to the calendar. My hubby and I are doing very well at snow removal. You get pretty good at it when your driveway is 300 feet long. I am getting ready to finish up several quilts that I tinkered with over the winter. I must say, quilts for warmth and cuddling in are much more in need up here in Wisconsin than they were in south Florida. In Florida, quilts tend to be more of an artistic decorative nature. No matter what their purpose, I love them all. My little snowman looks like he could have used a quilt. I'd like to say that I finished all sorts of new quilt patterns this winter, I said I’d like to say it, but I can’t. Oh me, oh my. 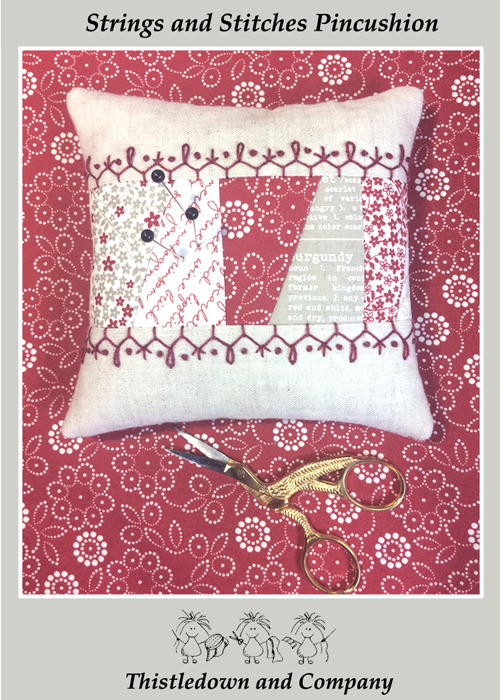 I did finish a cute new pin cushion pattern that incorporates string piecing and some simple hand embroidery. It's called “Strings and Stitches” and you can order it on my website or my Etsy shop. 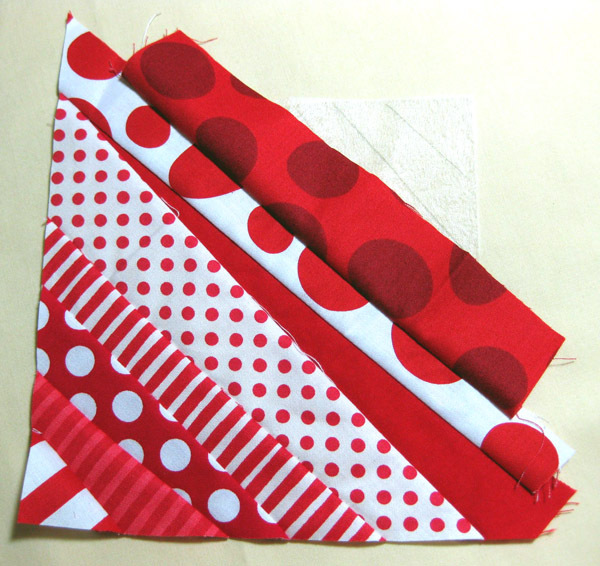 I used the Project Red fabrics by Sweetwater for Moda. I paired them with a natural linen for the front and back. I do have several kits available on my Etsy shop, so hurry on by and scoop one up. Thanks for stopping by, I'll have more to share soon. Enjoy the Springtime! 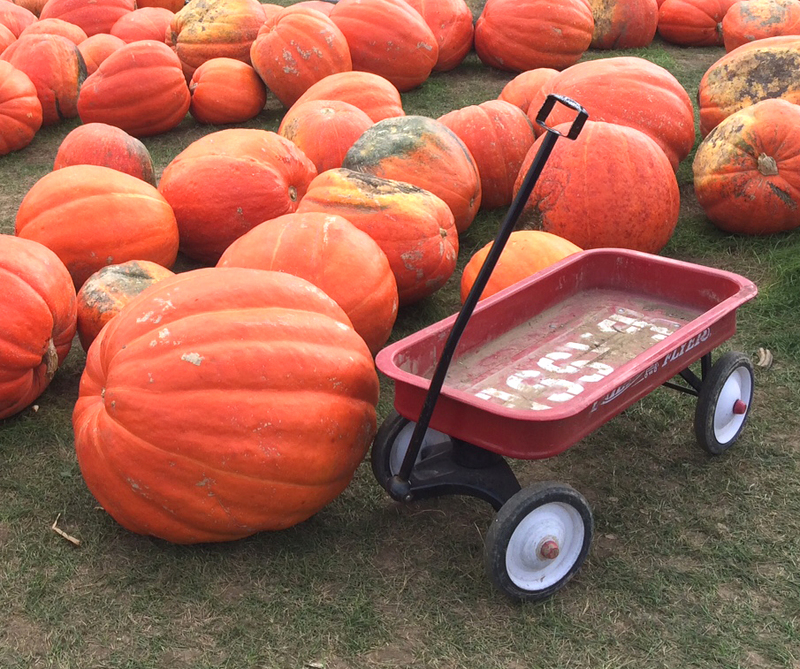 It's Autumn and that means cozy plaids, soft cuddly sweaters and scarves, the bringing out of more quilts to keep off the coming chill, pumpkin spice everywhere, and slow stitching days with friends. 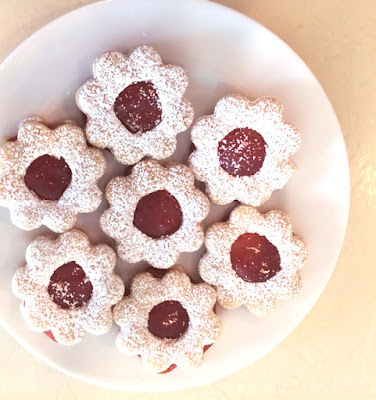 I got the baking bug today and wanted to share this super easy cookie recipe that is yummy, easy and pretty. It' a great recipe when the baking bug hits you but you don't have a bunch of baking ingredients on hand. The refrigerated pie crusts are easy to keep on hand. You can whip these out in a jiffy for those last minute impromptu gatherings. 1 package of pie crust ( the kind in the refrigerator section, it's pre rolled in the package. 1 small jar of seedless strawberry jam or other preferred flavor. Apricot and current are also great choices. Round cookie cutter about 3-4"
Unroll pie dough on a lightly floured surface. Cut out shapes from dough with the cookie cutter. Gather up the remnants of the dough and roll out again and cut more shapes. On half of the cookie cut outs, cut a circle out of the middle. Place all of the cookie shapes on the parchment lined cookie sheet and bake about 12-13 minutes or until barely golden. Remove from oven and spread the jam on the solid cookies. Top with the cut out cookies. Sprinkle with powdered sugar. Serve with a nice cup of tea, coffee or cocoa. Mmmmmmm! I am lucky enough to moonlight,very part time, at a really fun quilt shop, My Material Matters. The other day a customer came in with questions on how to repair and wash a quilt that they found in her families home. When she took it out of the bag and laid it out on the table, I was in for a real treat. It was a gorgeous antique redwork quilt. 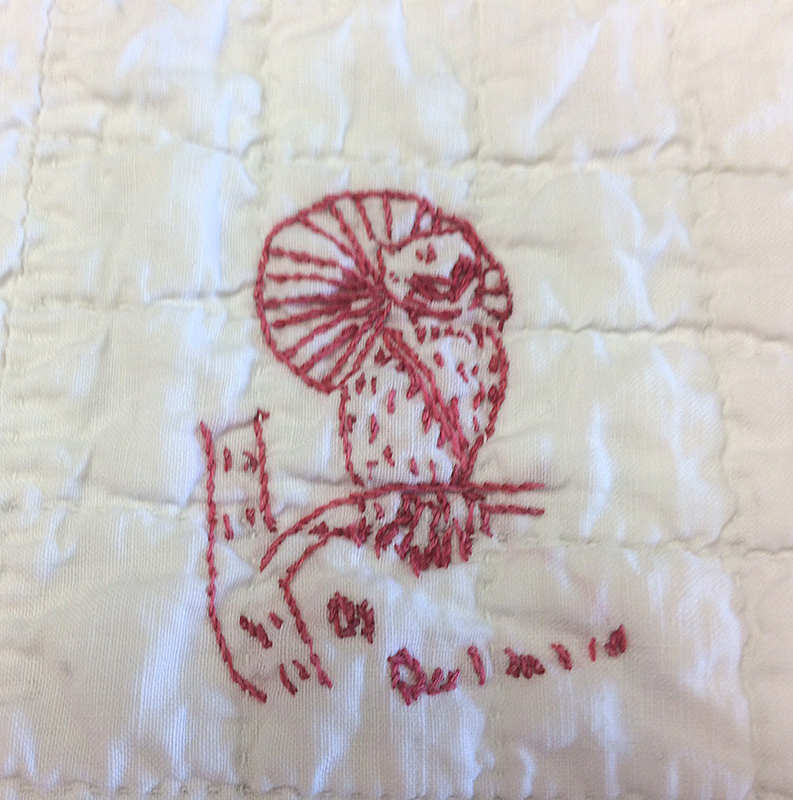 I enjoy handwork, and love to see antique quilts, and I was enthralled with it. It was in beautiful condition with the exception of some wear on the binding at the top of the quilt and a couple of tiny stains. As we spread the quilt out more, I saw the date stitched into it......omg 1896! It's a wonder that is in such wonderful condition. Not only that, but the stitching was wonderful, and the motifs and phrases were so unique and charming. What a treasure they had. She wasn't sure where it came from. It had a name on it (Edna) but she didn't know who Edna was. My mom's name is Edna, but she wouldn't give it to me....HAHAHAHA. No really. She had no knowledge of quilts and so I filled her in to the best of my knowledge. I then happily referred her to the Wisconsin Museum of Quilts and Fiber Arts in Cedarburg WI for further information and guidance. Hopefully she was able to get more expert information and i hope the quilt will find a treasured place in her home, or in the museum. Do you enjoy hand work such as hand quilting or hand embroidery? Obviously this person did! I am so glad I was there when she brought it in and also happy that it didn't get discarded by the family. 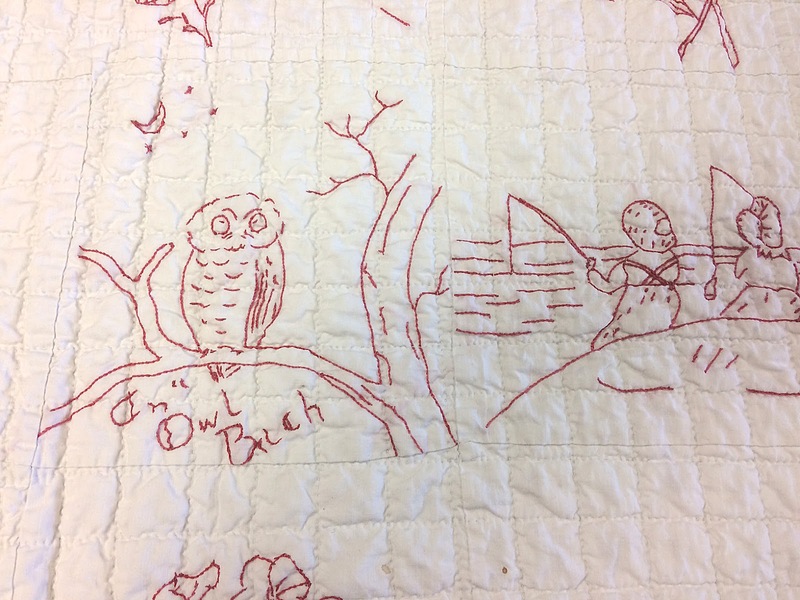 Do you have a plan for your quilts after your gone? perhaps it's time to think about your most treasured quilts and document where you want them to live. 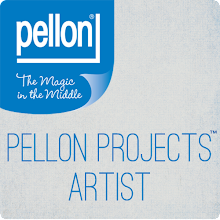 Hi there, I've been a busy bee, I am redesigning my website for a more user friendly experience. In the process I've decided to place my tutorials over here on my blog. Please bear with me. I am trying my best to get them all over here quickly. 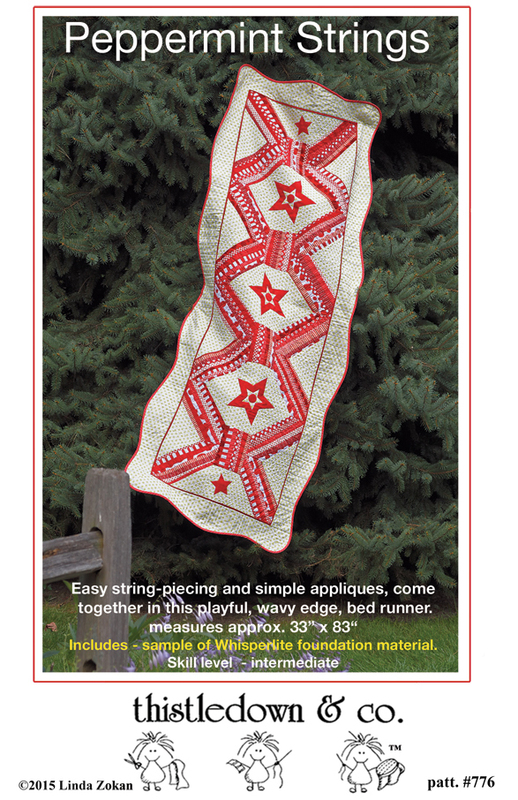 The first one is a tutorial on how to String piece a quilt block. In the case of quilts, the term string, actually refers to strips of fabric. 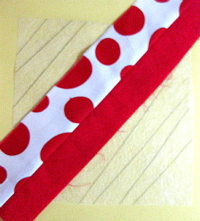 The fabric strips can be of almost any width. Usually 2-1/2" or less, all the way down to 1/2" if you dare. 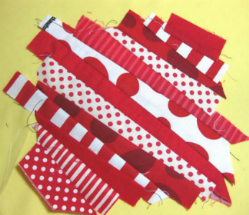 The strips or "strings" are stitched side by side to a base foundation for the purpose of stabilizing any bias edges (especially if using scraps) and to keep the strings straight (not curving) and on course. 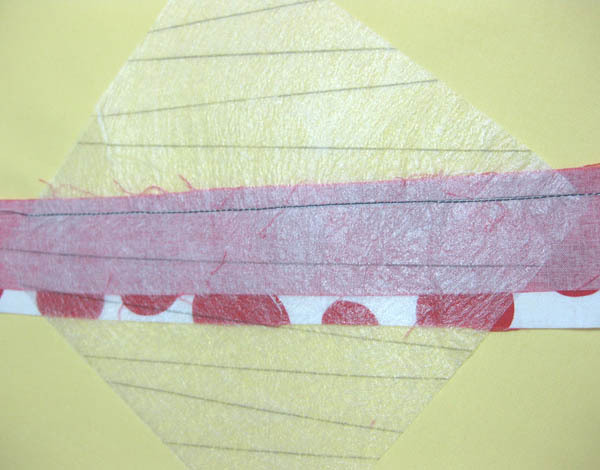 In many cases, as in the tutorial below, the strings are stitched diagonally across the quilt block. String quilts are a fabulous way to use up your stash for a scrappy look. you can also be more precise about color choices and placement for a more graphic and dramatic quilt. Below is my tutorial for making a string quilt block using Whisperlite as the foundation instead of muslin or paper. You'll love it. String piecing is a great way to utilize your fabric scraps, use up some of your precious fabric stash, or, you can always go shopping at your favorite quilt shop for more. That is very messy, and time consuming. Don't know about you, but I'd rather spend my time stitching than tearing. By using Whisperlite as the foundation, there is no need to remove it when you are done sewing, and it is super lightweight. You can barely tell it is there. You can "string piece" free form (without any drawn lines) or, if you like, you can draw the position and width of the strings directly on the whisperlite foundation. 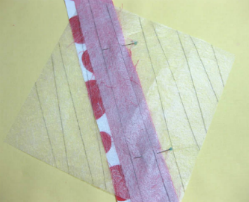 In this example I am showing a string pieced quilt block with the stitching lines drawn on the Whisperlite tracer foundation, and placed diagonally on the block foundation. Step 1. Cut the Whisperlite foundation to the size of the block you want. Make sure to add your 1/4" seam allowance to all sides. Draw the stitching lines for the "strings" of your block with a regular pencil. The closer together the lines are, the smaller your strings will be. That means you can use narrower strips, but it also means more stitching. The strings can be of varying widths, and can be lined up evenly, or skewed like this example. It's up to you or the pattern you are using. Step 2. 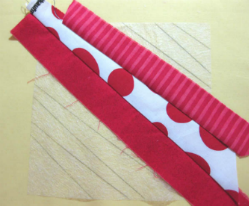 Cut your fabric into 'strings" (strips) allowing extra width for seam allowances and placement. I cut most of mine 1-1/2" to 2-1/2" but again it's depends on your design. Place two of the strings right sides together, and place them under the Whisperlite with at least 1/4" extending past the line you are going to stitch on. You can start in the center as I did here, or, start from one corner and travel across the block. Pin the strings in place. Step 3. Stitch your first strings on the drawn stitching line, with the Whisperlite on the top, through all layers. I used a dark thread so you can see it better. Step 4. 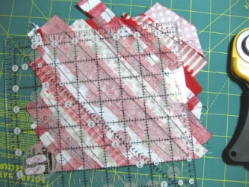 Turn your block over so the fabric is on top, then flip the strips open as shown. Press. The new string should cover the next stitching line with an additional 1/4" for the next seam. You can hold and fold your strings as you put them in place to be sure they are wide enough before stitching them in place. If you are free-form stringing you don't have to worry about it. Step 5. 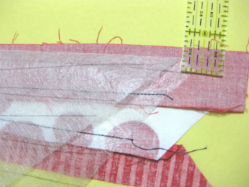 If your seam allowance of the just stitched seam is more than 1/4", trim the seam allowance to 1/4". Do this after adding each string. Step 6. Add another string to the last one sewn. Make sure that when you place it, that you have at least a 1/4" seam allowance past the next line that is on the foundation. Step 7. Continue adding strings until the entire block of the Whisperlite foundation is covered with fabric strings. of the Whisperlite as your trimming guide, or use the markings on your ruler. Caution....you may find yourself addicted to string piecing. Here's a block that I started from one corner and I have trimmed two sides. I hope this tutorial fully explains String-piecing, or foundation-piecing to you. It's a fun technique, give it a try. Whisperlite tracer/ foundation is sold by the yard. Whisperlite 42" wide. It is not a fusible product but you can iron it and fuse to it. You can find it here...or here.... or ask for it at your favorite quilt shop. 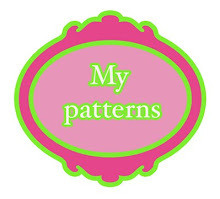 This is the pattern that inspired this tutorial. If this is your first visit to my blog, or a return visit, thank you for spending some time here. This is my blog written by me, no ghost authors here but I'm sure that is evident as my grammar will not pass muster with any English majors (or minors for that matter) but I will do my best to share interesting and even mundane aspects of my life as a quilter and quilt pattern designer. Into that mix I will be adding my attempts at gardening, being organized - HA , boosting creativity, and other everyday happenings. I should warn you in advance - I am a recovering procrastinator! So don't expect me to post daily, (won't happen) but I will try to surprise you with frequent postings. My life as a quilt designer and optimistic pollyanna, revolves around my husband, home, family, friends, faith and of course quilts. Though the order may change from time to time as it does in everyone's life, the importance of them all, does not. If you get a chance visit my etsy shop where you can find studio samples, and other assorted pieces of whimsy and what not. Just a reminder, all images, graphics and text are copyrighted ©Linda Zokan and may not be used without written consent. Free PDF downloads when provided are for your personal use only and not for distribution or commercial purposes.